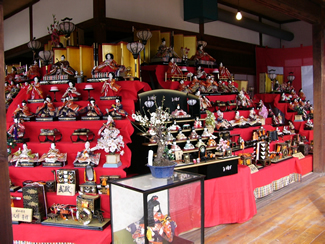 Hina Dolls will be displayed at approx. 60 stores and restaurants throughout Shinmachi. People enjoy looking at them as they stroll through town. On festival day, a hot sweet alcoholic drink called amazake will be given away and sales of fresh local produce are scheduled at the main venue mentioned below. Marking the 22nd Hinamatsuri, this annual event has become the most well-known early spring seasonal event in Ikaho. It features live Hina dolls, actual nursery school toddlers dressed in traditional costumes and make-up. They line up on red-carpeted stone-steps just as the real Hina dolls do and are as adorable as they can be. This monthly event is held on the first Saturday of every month. 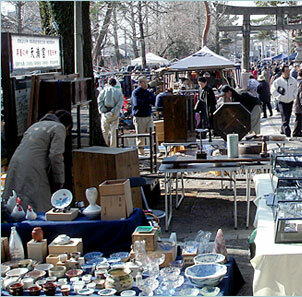 Exhibitors from all over the Kanto Region will showcase antique clothing and other rare finds for sale on the premises of the Kiryu Tenmangu Shrine. As part of an exhibition of the museum's collection of Japanese paintings, Yukihiko YASUDA's artworks will be on display, including his gold standard and the great folding screen. Here's an opportunity for you to appreciate some of the best works in Japanese style paintings. GUNMA CHILDREN'S LAND in Ota will present an uplifting play about a boy who develops and nurtures a friendship with an old lady-(who is really a fairy). Admission is free. Seating capacity of the theater-is 200. 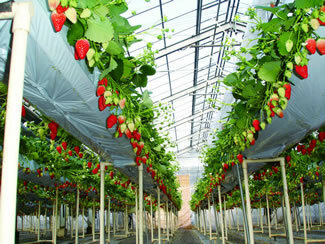 Until the end of May, strawberry farms at the foot of Mt. Akagiyama are in season. Garden-fresh Yayoihime strawberries are as sweet as ever. In the farm, strawberries are all-you-can-eat for JPY1,500 for adults and 1,300 for children.